You are here: Home » Outside Tibet » Two leaders of anti-Tibetan group in Arunachal held for extortion etc. Two leaders of anti-Tibetan group in Arunachal held for extortion etc. (TibetanReview.net, Jul26, 2018) – Following multiple complaints of extortion from traders and government officials, police in Arunachal Pradesh have on Jul 24 detained two leaders of a fringe student group that has been agitating to oppose possible government welfare and other facilities for Tibetan refugees living in the state. 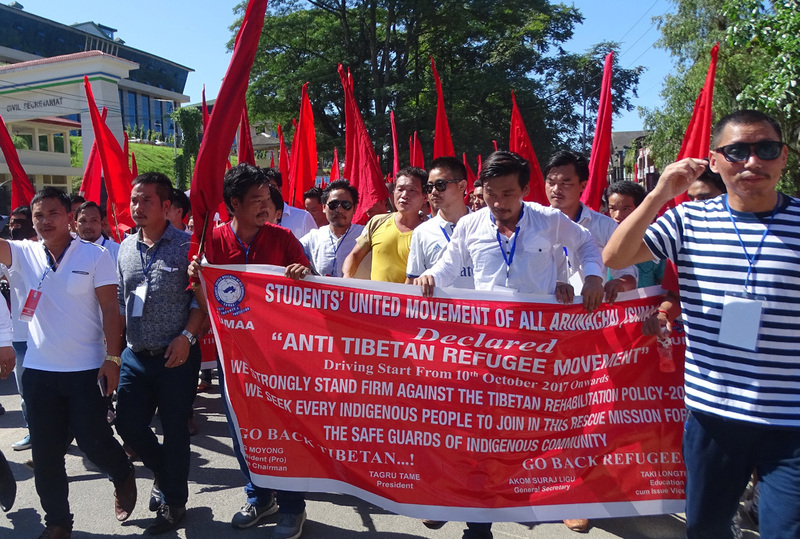 General Secretary Suraj Ligu and Convenor Tarh Rekam of the Students’ Union Movement of All Arunachal (SUMAA) were detained on an order issued by the West Kameng deputy commissioner under Arunachal Pradesh Unlawful Activities (Prevention) Act, 2014, reported arunachaltimes.in Jul 25. “The extortion attempts were in connection with the SUMAA activities in Bomdila. A case of attempt to extortion has been registered at the Naharlagun police station and the police are on the lookout for other accused persons as well,” the report quoted Capital Complex Superintendent of Police (SP) M Harsha Vardhan as saying. They were reported to have been taken to the capital complex deputy commissioner’s office for production before the district magistrate who remanded them to judicial custody. Several SUMAA members were reported to have surrounded the district jail in Jully, where the two leaders were lodged, for a few hours later in the evening, threatening officials on duty. The report cited capital SP as saying the police had already begun the process of identifying those protesters for the purpose of arresting them. “I appeal to all concerned to not tolerate extortion and report to us if they face any such issue. We will definitely take action,” the SP was reported to have assured. SUMAA president Tagru Tame has, however, claimed that his group did not intimidate the traders in Bomdila; that the traders had, in fact, assured support in its drive against the Tibetan refugees. He has vowed to continue what he has called his group’s movement in the interest of the indigenous people of the state.